Everyone is familiar with and fond of the local pumpkin stand that springs up around Halloween and the fall harvest time. 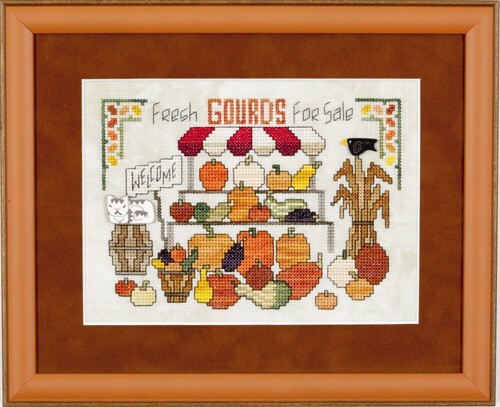 This one is no exception and has just about every type of gourd you can think of! General Information: Stitched using 2 threads of floss over 2 threads of fabric. Stitched almost entirely in full stitches. A few quarter stitches can be found in the “Welcome” sign. Contains a significant amount of backstitching. Design Area: 7″w X 4-3/4″h. Fibers: A total of 23 colors of Weeks Dye Works Hand Over-Dyed cotton floss were used in the model. Sullivans, DMC and Anchor “best match” colors are also provided in the chart below. Other materials: JABCO (Just Another Button Company) Button Pack #10090 used but not required to complete the design. A stitch option for the cat and the black rook is not provided.